It’s not easy to figure out what the Sedona Vortexes are all about. Some say the vortex is a result of intersecting Ley Lines, some say vortexes are formed by magnetic energy, and others point out that the energy flow of vortexes exists on a dimension deeper than electricity or magnetism. According to an alternative religions writer, “Leys or Ley lines are the grid patterns formed by drawing connecting lines between ancient megaliths, stone circles, and other ancient monuments. "These monuments are said to mark the intersection of telluric energy currents (the natural electric currents that make up the earth's magnetic field). Many have claimed that these areas are associated with increased paranormal activity or 'gateways' for supernatural or inter-dimensional beings." Many vortexes are thought to be associated with Ley Lines and have been found to be extremely strong at points where the lines cross. Worldwide, the Great Pyramid in Egypt and Stonehenge in England are perhaps the most well-known as centers of vortex activity. Some describe the vortexes as points of energy and the Ley Lines the connectors between these points. On the Vortex Maps site, there is a map showing Ley Lines. This map is thorough, although there isn't an explanation as to how the various vortex sites are aligned. So with Ley Line theory, it is not clear whether the vortexes are a result of the crossing of these lines or are the points at which the lines actually start. It is fascinating to ponder, however, that Sedona's special sites are somehow connected with others across the world. Many experts state that a vortex is a result of magnetic forces or concentrated energy. 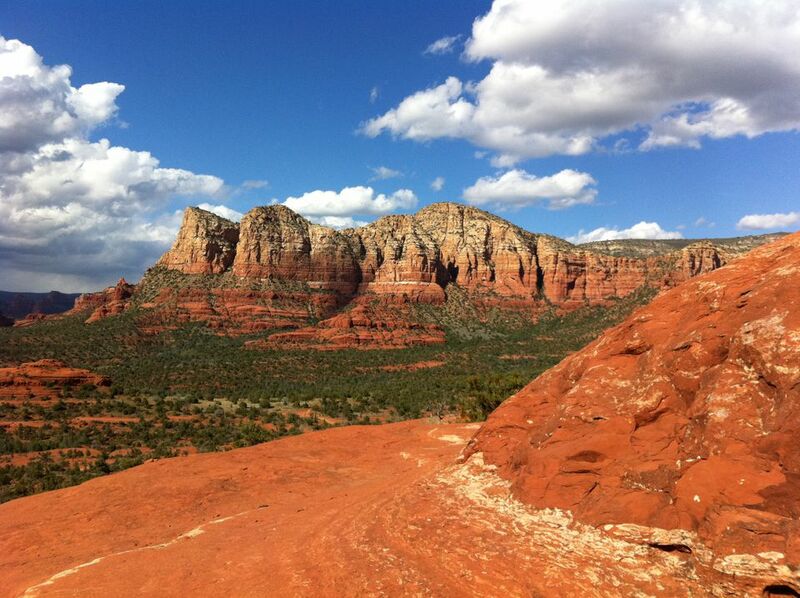 Others say that the iron in the red rocks of Sedona aligns with the iron in a person’s blood. On Vortex Tours, guests gather at a vortex site and guides demonstrate a magnetic pull with the help of copper dowsing rods. The guides point out that nearby trees are twisted, most likely as a result of these whirling magnetic forces. Most agree that the vortexes of Sedona are more oriented toward the energy of the spiritual type. Pete A. Sanders, Jr., who is a graduate of MIT, takes a scientific approach to explain the energy flow of Sedona Vortexes. He believes that since people cannot thoroughly explain the vortexes using electromagnetic theory or confirm Ley Line theory, then there must be another way of thinking. Mr. Sanders explains that the dimensions everyone is aware of (time, three dimensions) are only four of 10 or more dimensions. Physicists, using Superstring theory, have pointed out that there is more out there than everyone realizes. String theory is a mathematical theory that tries to explain certain phenomena that are not currently explainable under the standard model of quantum physics. His argument was a charge to “think outside the box” when it comes to understanding the vortexes of Sedona and the realities of the world. He pointed out that spiritual energy flows like thermal wind currents. He advocates using “every day” vortexes in meditation and healing. His perspective is that there is a mind-body connection and that the search for spiritual strength and healing is more important than the quest to find current reality, hard facts to explain vortexes. Nevertheless, people have a need to develop a framework to understand things. Mr. Sanders developed a classification system that makes sense and helps the individual use the spiritual energy to facilitate healing and spiritual growth. Mr. Sander’s labeling system is based on the direction of energy flow at the vortex site. He points out that Upflow vortexes are locations where the energy is flowing upward out of the earth. Inflow vortexes are locations where energy is flowing inward into the planet. “Just as hawks and eagles soar on thermal wind currents, Upflow Vortexes help your Soul reach great heights of awareness. Inflow Vortexes help you go inward more easily." In relation to God, Upflow vortexes might take thoughts and prayers aloft, where people perceive God as existing. Inflow vortexes would be useful for inward meditation as well as for receiving and processing guidance from God. Mr. Sanders explains other vortex theories in relation to his energy flow theory, which helps make sense of the classification system. With electromagnetic theories, think of how magnets attract and pull in. Every place labeled as a magnetic vortex, Mr. Sanders explains, is an inflow area. As you look at the masculine and feminine labels some give vortexes, that, also, can be explained in relation to energy flow. Pete explained that females have a tendency to excel in introspection and awareness of personal feelings so the term “female vortex” would be used to label the inflow of energy. Conversely, the masculine principle matches that with the outward, assertive expansiveness of the upflow energy pattern. For whatever reason, Sedona is a very beautiful and spiritual place. The Native Americans were drawn to it and considered the area sacred. It is an ideal place to go for a getaway for fun, for renewal, or for spiritual exploration. No matter what your beliefs about vortexes or how you choose to classify them, there remains a few mysteries in Sedona that have not been adequately explained. Go to the Red Rocks with an open mind and open heart.